As I read the message it became clear that the topics and subjects covered were as important and of concern decades ago as they are today. 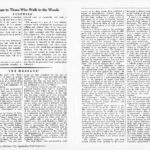 This publication is prompted by a situation of paramount concern to all who turn to the woods and forested hills of the eastern Atlantic States for recreation. It is a matter most vital to those who walk, camp, use, or maintain trails. The situation merits your most careful consideration. Your aid is urgently sought in the solution of the problems here set forth. If these difficulties are not soon eliminated, users of trails and those who walk in the woods will inevitably find the areas and opportunities for their recreation very considerably restricted. Conceivably, if the problems are not solved, the recreational use of large sections of privately-owned lands will be matter of the past. 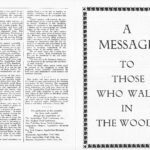 This appeal and this message to you and to all woods walkers is definitely intended to forestall such an eventuality and such a calamity. This message is part of a very definite campaign being conducted by associations of walking and outdoor clubs. It has been prepared and is being distributed by the outdoor clubs associated with the Appalachian Trail Conference. This group has undertaken to lead in an effort to solve the problems. It speaks not for itself alone but for all groups. Its program is intended to call attention to the careless, unnecessary and often regrettably wanton acts, which have precipitated this situation. You can aid this campaign by your personal example in giving heed to the monitions herein contained; you can urge compliance by others; further, you can aid in placing this leaflet in the hands of those who may thereby be prevented from creating these difficulties. This booklet deals with the “Trail Etiquette”. 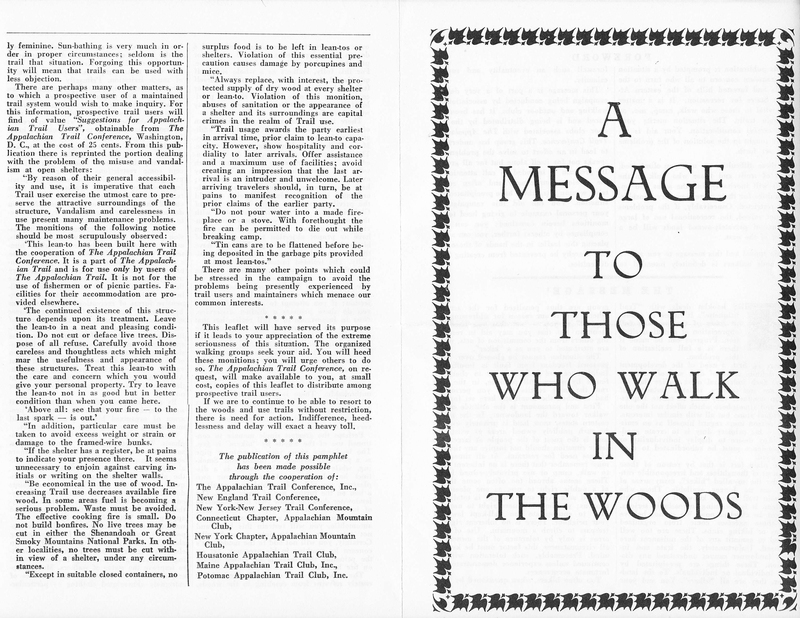 It hopes to arouse in users of the woods a full appreciation of a critical situation. Progress can be made if there is a full realization of this problem. There is, first, a need of the development of a definite sense of duty and of responsibility. Each individual must realize that his acts are not solitary, isolated instances of human conduct; they tend to create impressions and atmosphere which affect not the one individual alone but all with similar interests. Each person must regard himself as an emissary _ his primary duty is to create goodwill. Any desire to display individuality or independence must be subordinated to common good. The plain fact is that by reason of these instances of thoughtless and irresponsible conduct by the so-called “hiker”, many areas of land are no longer available. Those who maintain trail systems know all too well this problem. It is becoming increasingly serious. It must be checked now. We cannot believe that these excesses come from organized groups or hiking clubs. These are too well trained to commit any of the nuisances here discussed. Unfortunately, the irate and injured landowner cannot understand any distinction. These things are precipitated by some individual or individuals. To the landowner, they are all “hikers”. You and your group are thus penalized for the acts of others. This is our reason for addressing this “appeal” to you. Not that you need the monition but that you may aid in restraining others from the commission of the acts, which are attributed to you as a “hiker”. The situation cannot be glossed over. Your personal freedom from fault is insufficient. Indifference and failure to act to check offenses by others will produce, in the long run, the same results as if you personally had breached the monitions here set forth. First and paramount is the attitude of the walker toward the landowner. In the northeastern states, most land is privately owned; in such publicly owned areas as exist, the user is the guest of the people at large. The latter situation should not inspire any thought of less need for restraint. At all times one must remember that there is no inherent right to walk camp or use privately-owned lands. There seems abroad to often some theory of a public right to use, as on pleases, a wooded area. Any such thought is totally erroneous; you have no more right to use this than to appropriate the well-kept lawn of your neighbor. There is no inherent right to trespass to climb a mountain. Use of such areas is only by tolerance of the owner; in all circumstances, this factor must be kept in mind. Presumably, such toleration will be continues unless experience demonstrates unfortunate occurrences. Too often hikers, when questioned by landowners, or by their agents, have exhibited a degree of independence, claimed rights or privileges and have instanced near insolence. For this folly, walkers as a whole suffer. If questioned, be at pains to identify yourself fully and state your objectives and outdoor connections. Make no claim of right or privilege; treat the situation as if your property were that affected. There is a distinct value in the exhibition of insignia, showing connection with or affiliated with outdoor clubs or organizations. Many of these are known by general refute. The connection is often accepted by the owner as a sort of guarantee of conduct, which will not impair his interests. There may exist, personal distaste to displaying insignia; here again personal preference must be subordinated in an organized campaign to hold privileges we now have. The display of Club insignia or connection, coupled with the proper conduct of your party, may convince an uncertain landowner that he can have no proper objection to the crossing of his land by organized groups. You may have thereby created and impression of responsibility. The isolated instance does count. Further, it is most important to realize that the use of a marked trail, such as The Appalachian Trail, or otherwise, confers no right to use land against the owner’s objection; if you attempt to claim such rights, you do these projects a distinct disservice. Next in importance to full realization that there is no question of rights (you have none) or privileges in the use of the woods but of responsibilities and duties, there is a marked need for the exercise of restraint. Unfortunately, once in the woods, some individuals seem to react too strongly to the freedom of the surroundings. Acts are committed which in their own homes would be unthinkable. There is a real need to check this exuberance. Yelling, singing, conduct designed to attract attention, are totally unnecessary. It merely invites attention with very detrimental results. Perhaps the greatest single menace to continued use of the woods by “hikers” is fire. The landowner views your cigarette or pipe as a potential menace. So should you. Smoking while walking in the woods is a distinct hazard; if you do so for your own pleasure, you risk a fire which may result in a ban on the further use of many areas. The landowner does not know your high standards of individual care; he does not know that unlike the flicking of a cigarette from your automobile, you will restrain this habit and not toss your cigarette into a brush pile. Certainly, you will not add to the landowner’s concern by smoking in his presence. Act on the principle that there is not closed season on fire hazards. The walker, who consciously and deliberately refrains from smoking in the woods, has made a distinct sacrifice which will ensure to the benefit of all walkers. As his tribe increases, so will our privileges. A word as to campfires; herein is a source of much irritation. Primarily a fire should never be built without the permission of the landowner. The major trouble lies with the so called “lunch fire”. If you regard this element as a necessity, despite the ease with which it can be dispensed with, you are deliberately contributing to the problems here. It is a simple matter to carry lunch foods which require no cooking; every walker should do so. This suggestion may invoke objection; the issue is whether you will accept some restrictions or contribute to the precipitation of a situation where all privileges will be revoked. Traces of our fires remain to inform the landowner of what occurred there. Build no fires; state that you do not; your host, the land owner, will therein find your presence less objectionable. Again, there is the matter of the impression generally created by walkers. As to this, each user of the woods must consider himself a “goodwill ambassador”. There must be a definite attempt to elevate the popular impression of hikers and the reason why they indulge in this form of recreation. It is for their physical, mental and spiritual well-being. It is definitely not because more expensive forms of recreation are denied them by financial limitations. One camps because of personal preference, for the pleasure of camping, not because one cannot afford public accommodations. Unfortunately, it must be appreciated that we labor under the impression created some years ago by the gentlemen of the open road. Your conduct and what you do will tend to dispel this impression. Avoid the creation of any impression that the person who walks seeks something for nothing. By and large, one who participates in trail work thereby meets his obligations. The program of organized hiking groups and trail maintaining systems deserve some support. There is a further matter which needs emphasis. This again calls for restraint of personal freedom which the being out of doors seems to inspire. This relates to your personal appearance; beards, clothing, or, of late the absence of clothing. One may well inquire if particular attention to these points does not account for the exalted status enjoyed by skiing. Unfortunately, for hiking, anything and your oldest clothing is considered appropriate. With changing fashions many walkers consider it in order to utilize the opportunity, while walking for sunbathing also. This facility again one can easily obtain elsewhere under proper circumstances. Grafting sunbathing on walking has not tended to improve the status of walkers. Many property owners look askance at the instances of extremely abbreviated clothing in particularly feminine. Sun-bathing is very much in order in proper circumstances; seldom is the trail that situation. Forgoing this opportunity will mean that trails can be used with less objection. ‘This lean-to has been built here with the cooperation of The Appalachian Trail Conference. It is a part of The Appalachian Trail and is for use only by users of the Appalachian Trail. It is not for the use of fisherman or of picnic parties. Facilities for their accommodation are provided elsewhere. ‘The continued existence of this structure depends upon its treatment. Leave the lean-to in a neat and pleasing condition. Do not cut or deface live trees. Dispose of all refuse. Carefully avoid those careless and thoughtless acts which might mar the usefulness and appearance of these structures. Treat this lean-to with the care and concern which you would give your personal property. Try to leave the lean-to not in as good, but in better condition than when you came here. “If the shelter has a register, be at pains to indicate your presence there. It seems unnecessary to enjoin against carving initials or writing on the shelter walls. “Be economical in the use of wood. Increasing trail use decreases available firewood. In some areas fuel is becoming a serious problem. Waste must be avoided. The effective cooking fire is small. Do not build bonfires. No live trees may be cut in either the Shenandoah or Great Smoky Mountains National Parks. In other localities, no trees must be cut within view of a shelter, under any circumstances. “Except in suitable closed containers, no surplus food is to be left in lean-tos or shelters. Violation of this essential precaution causes damage by porcupines and mice. “Always replace with interest, the protected supply of dry wood at every shelter or lean-to. Violation of this monition abuses of sanitation or the appearance of a shelter and its surroundings are capital crimes in the realm of Trail use. “Trail usage awards the party earliest in arrival time, prior claim to lean=to capacity. However, show hospitality and cordiality to later arrivals. Offer assistance and a maximum use of facilities; avoid creating an impression that the last arrival is an intruder and unwelcomed. Later arriving travelers should in turn, be at pains to manifest recognition of the prior claims of the earlier party. “Do not pour water into a made fireplace or a stove. With forethought the fire can be permitted to die out while breaking camp. “Tin cans are to be flattened before being deposited in the garbage pits provided at most lean-tos”. There are many other points which could be stressed in the campaign to avoid the problems being presently experienced by trail users and maintainers which menace our common interests. This leaflet will have served its purpose if it leads to your appreciation of the extreme seriousness of this situation. The organized walking groups seek your aid. You will heed these monitions; you will urge others to do so. The Appalachian Trail Conference, on request, will make available to you, at small cost, copies of this leaflet to distribute among prospective trail users. If we are to continue to be able to resort to the woods and use trails without restriction, there is need for action. Indifference, heedlessness and delay will exact a heavy toll. The Appalachian Trail Conference, Inc.
Maine Appalachian Trail Club, Inc.
Potomac Appalachian Trail Club, Inc.
From reading this message, we can see the appropriate and responsible use of the AT has been of concern for many many years. While times have changed (I believe beards are an acceptable attire for a male hiker) we still have the same responsibilities now as the hikers of the early part of the last century were facing. Happy Trails! 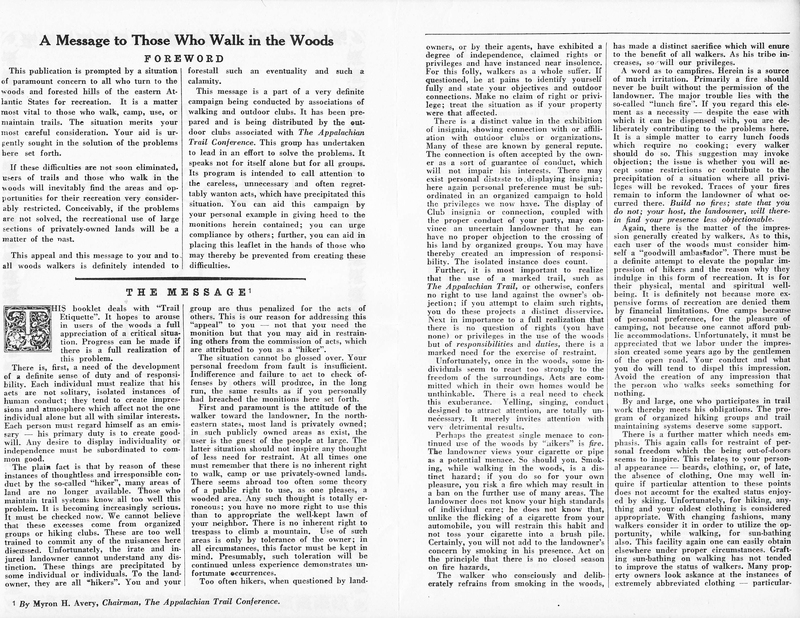 I wish to thank the Appalachian Trail Conservancy for allowing me to reprint this document. I have my guide books from when I did the trail in 1971. If you are interested you can have them. Let me know and I can mail them to you. That would be great David, thanks! What an amazing document from a simpler (socially) yet more complicated (much of the AT on private land) time. The fact that Myron Avery was an attorney shines through in this document, doesn’t it? A couple of lines really hit home for me. I loved his reference to “Gentlemen of the road”. Of course in 1954, only two decades after the Great Depression, vagabonds, hobos, “gentlemen of the road”, were a common sight in the US. And his sincere concern that hikers not be perceived as hobos was well intentioned. The question today is how does one guard against the temptation to make Trail life a lifestyle choice? And finally, his sentence: “It seems unnecessary to enjoin against carving initials or writing on the shelter walls.” is a glimpse into a simpler time. A time when hikers were were possessed of a social conscience and considered defacing public property as a felonious act. Today, some AT hikers are so narcissistic that they think nothing of putting their name/initials/date of transit on any/every surface conceivable, forever altering the experience of all future hikers. I think if Myron Avery were somehow transported to 2016, he would be amazed at how the AT has changed, and chagrined at how AT hikers have changed. And yes, I do understand that I am a curmudgeon so you need not point out the obvious. Wow, TicTac said what I was thinking nearly word for word…..to add to that I hiked a very small piece of the ATnear Clingmans Dome last week. Found human feces in the middle of the trail – I was dumbfounded… seems many more hikers do not carry with them the beliefs that came before them…. This was my first time actually putting my foot on the trail and the memory that remains from it. There were many trees with carved initials and even some trash discarded along the few miles I did. Clouded my dream a bit…sadly this is the reality everywhere these days…. +1 for TicTac! Sadly, we are faced with the same challenges Avery remarks on 40 years ago today. In fact, from my perspective as a hiker and long time Trail volunteer, the situation today is worse in many ways. From entitled hikers (of all abilities–not just Thru’s) to just plain ignorant disregard of those who are following behind you, there are some days when I think we’d be better off with Rangers in Smoky hats at every trailhead. If people would pack their brains along with their backpacks, I think we’d have a shot at not losing all we’ve gained.